The biggest cliches often hold truth in them. When it comes to sales and marketing, it’s said that they seem to be on separate islands. A bit weird, since there are no teams closer related to each other than these two. They both want the same thing: make your business successful by selling more. Sales try to do that by one-on-one contacts, where marketing usually goes for a more broad approach. But the best results will be gained if these two teams play nice with each other and reinforce their mutual actions. 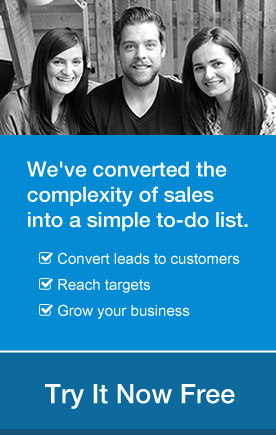 OnePageCRM holds your sales’ to-do list. It simplifies the sales process by adding actional tasks to leads and contacts. This database is the heart of your business. It holds all the information your teams need to make your business thrive. But, more often than not, your marketing team works with a different tool to communicate with your clients and prospects. They send out a promotion to prospective clients, but your sales have no idea who clicked on the offer in the email communication. Looking from another perspective, there might be 50 more leads added to your CRM that aren’t in your marketing database yet and thus aren’t targeted with that special promo. Working with 2 separate cloud apps is not necessarily bad for your business. After all, you want to be working with systems that cater to your specific needs. But working with two separate databases can harm your sales’ and marketing’s effectiveness. Luckily there is a simple and straightforward solution for this problem: integrating your CRM and marketing platforms. Let your CRM be the heart of your company and your main database, and connect your marketing platform in a way that both systems work in harmony and communicate in real-time with each other. This way you’ll get more out of your marketing platform. For example, Campaign Monitor, an email marketing app, let’s you built your email lists with very precise segmentation. These segmentation factors are based on CRM characteristics. So how do we connect the two if they don’t have a direct integration? Introducing PieSync. First, you’ll need a PieSync account. It’s fast & easy to create one. A trial will last for 14 days. If you don’t have a Campaign Monitor account yet, they offer a free trial. Within PieSync you’ll need to authorize your accounts, so PieSync knows what apps to connect with one another. Syncing brings us down to the level of the databases that Campaign Monitor and OnePageCRM are built on. 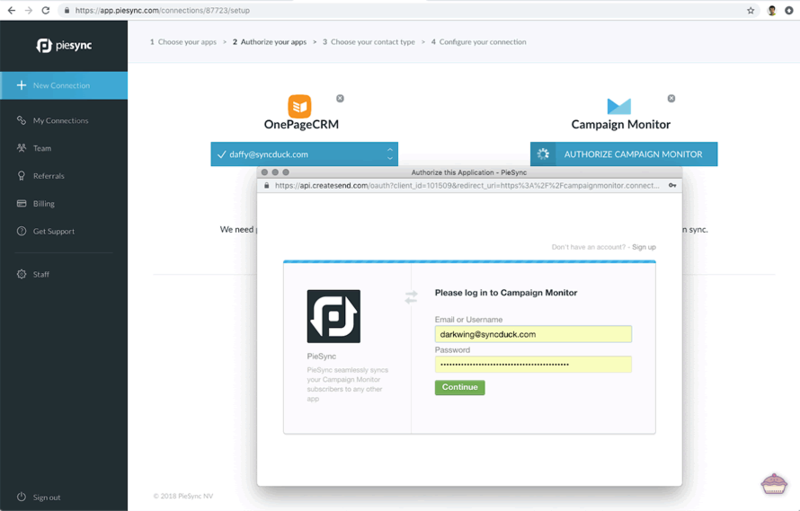 Attention, while your OnePageCRM only has one single database, in your Campaign Monitor you actually organize your contacts into separate lists. Each list acts as its own database with its own fields and contacts. If you only have one list in Campaign Monitor, it’s very straightforward. However, if you work with fairly distinct audiences, or have different marketing strategies, you’ll appreciate having multiple lists. Campaign Monitor advocates working with as few lists as possible. Select the list you want to sync data with and hit Next. Great! This brings you to the final setup screen of the sync which involves rules and mappings. This is where the fun begins. You start off with these two sync rules, one for each app. 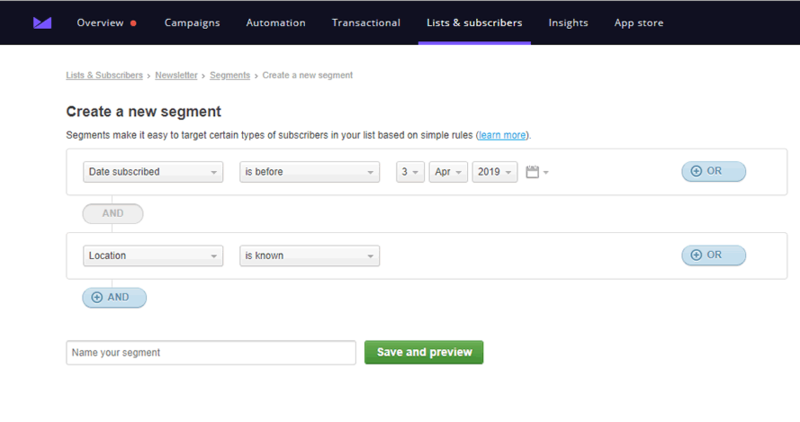 If you created a list in Campaign Monitor with a clear objective in mind, you’ll probably want to tweak that first rule, since not everyone in OnePageCRM should be getting the newsletter… Let’s apply a filter and include an action and see what happens. 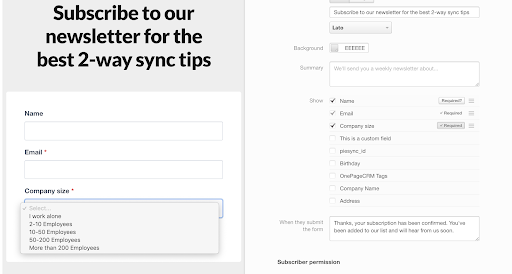 Now that there’s a filter of “tag = newsletter” , the sync has become much more narrow & controllable! Consider my contact Cammy, that I tagged “newsletter”. The rule above promptly moved Cammy onto the list in Campaign Monitor and she’ll now be getting the newsletter. Easy! And here we see Jeff as a fresh contact inside OnePageCRM, along with the “newsletter” tag and everything. Now that we understand the basics of a two-way sync, let’s see how we can make both apps play into each other even more. That brings us to the notion of field mapping. Field mapping ahoy! Using OnePageCRM data in campaigns. When two apps talk to one another, the field mapping defines the language that they do this in. This is necessary, because not all apps are created equal. For instance, in Campaign Monitor you only get one single data field to put a name in, the full name. In OnePageCRM, this is broken down in separate fields of a first & last name. Luckily, sync technology can overcome this problem. 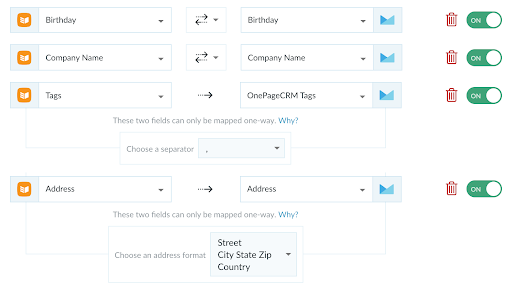 Inside your sync setup, you can and should include these custom mappings to ensure your CRM data is brought over in your campaigns. Not just for existing contacts, but also for future contacts, and constantly kept up to date. 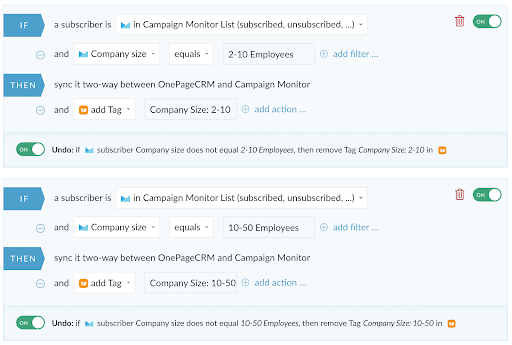 In the above example, I’m sending across the full array CRM tags and dropping them inside Campaign Monitor. All tags are captured by a simple custom field and this helps me build out Campaign Monitor segments! Imagine you frequently apply the tag VIP in your CRM. This tag is now available in Campaign Monitor. Just set up the mapping in PieSync, and build out the segment in Campaign Monitor – that’s it. Using Campaign Monitor data in OnePageCRM! 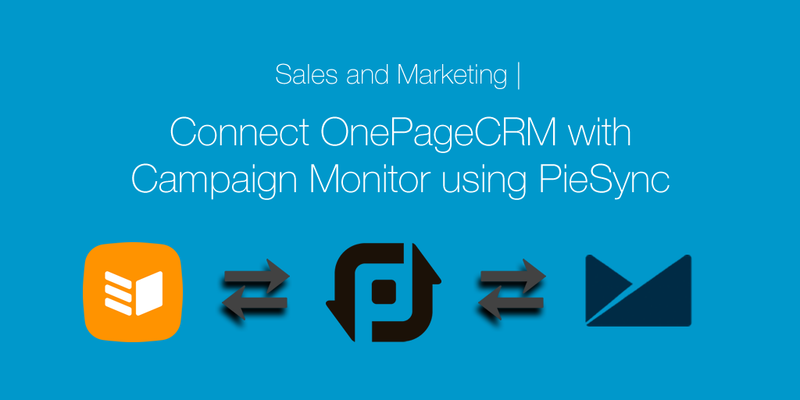 It’s a two-way sync between Campaign Monitor & OnePageCRM we’re setting up. Conversely, that means we can send information from Campaign Monitor custom fields back into our CRM. The most practical use case is that of landing pages where we’re asking our prospects more details than just their name & email address. We can be asking them business information, or certain elements that may help us tailor their newsletter experience. Whether it is through standalone landing pages or embedded bits of subscriber code, you can include custom fields. Consider the following landing page I’m designing, which includes a custom field that asks for “company size”. This field is not available by default. You can send the contents of this company size field back into your CRM, but that will require you to also create a custom field for it in your CRM. In that case, you would proceed through the custom mapping feature as we’ve shown earlier. I personally prefer to work with tags in my CRM, and not bury too much information into custom fields. In PieSync, I set up a couple of rules that apply a tag based on the information provided by a prospect. Each different answer translates to a different tag being applied to the prospect inside OnePageCRM. Through this sync, the attributes are made available inside OnePageCRM. Notice how Jeff now carries the tag “2-10 Employees”! Furthermore, the left sidebar includes handy shortcuts to drill down into all of your prospects, and even set up custom alerts for them! Ellen loves digital marketing and storytelling. As a content marketer, she makes sure our blog is full of interesting stories, tips, and case studies. When offline, she likes to climb, surf, take pictures and discover the hidden parts of Ghent.